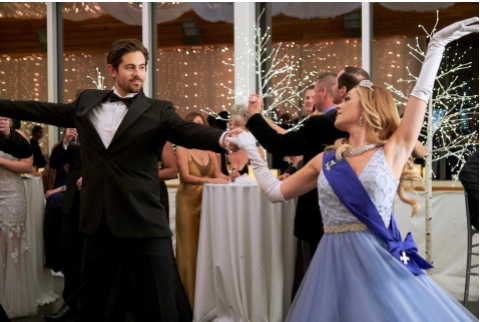 STUDIO CITY, CA – January 4, 2019 – Natalie Hall (“UnREAL,” “Charmed,” Only the Brave ) and Chris McNally (“When Calls the Heart Season 6,” “The Sweetest Heart”) star in “A Winter Princess,” a new, original movie premiering Saturday, January 18, (8 p.m. ET/PT) on Hallmark Channel as part of the network’s popular, annual “Winterfest” programming event. When Snowden Peak’s event planner quits days before the Snow Ball, Carly (Hall) is asked to plan the gala with Jesse (McNally), the resort owner’s handsome brother. The arrival of Carly’s twin brother, the Crown Prince of Landora, brings a distraction as his handsome companion has a crush on Carly. She’s flattered, but also confused about her feelings now that Jesse is on her mind. Also preoccupying Carly is keeping secret her royal identity, which Jesse discovers when he sees a package addressed to “Her Royal Highness.” Already smitten with Carly, Jesse agrees to stay mum. As the two settle on the Summit Lodge as the venue for the Snow Ball, Carly and Jesse convert the event into a fancy fundraising gala to help infuse much needed resources into the property. But without a celebrity draw, investors aren’t interested, and Snowden Peak is put up for sale. Will Carly allow her royal identity to be exposed to save the resort? “A Winter Princess” is a Marvista Entertainment Production in Association with Sepia Films. Larry Grimaldi, Hannah Pillemer and Fernando Szew are executive producers. Tina Pehme and Kim Roberts serve as producers. Allan Harmon directed from a screenplay by Erinne Dobson.